Rockslide path showing the scarp and boulder deposit. The observation deck to the right of the scarp is about 25 feet wide. A major rockslide occurred near the observation deck sometime between 6:00 p.m., February 17 and 8:00 a.m. February 18, 2001. The main scarp of the rockslide marking the detachment area of the rock block is about 30 feet northeast of the observation deck. The top of the scarp is along the rim of a northwest-facing slope excavated during development of the now abandoned quarry. Photographs of the area prior to the rockslide and conversations with David Cook, Eno River State Park Superintendent, indicate that prior to movement the rock block formed a promontory along the quarry face. Rock excavation during quarrying produced a 20-foot high (or greater) down slope face on the promontory that was nearly vertical with areas of overhang. Roughly estimated, the in-place volume of the detached rock was about 2,500 cubic yards, and weighed nearly 5,100 tons. 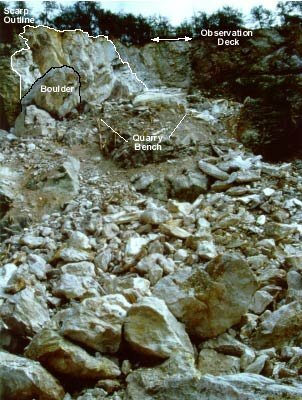 Once in motion, the sliding or toppling block broke into hundreds of boulders, probably upon impact with the quarry bench below. Sliding, rolling and bouncing boulders stripped bark and limbs to a height of 20 feet from trees along the 200-foot slide path that ended in the quarry floor. Larger boulders, some weighing nearly 125 tons with a volume of about 60 cubic yards, snapped and uprooted eight-inch diameter trees in their path. At the widest point, the swath of rock debris measures about 100ft. Confined to the quarry limits, the rockslide deposit did not reach the Eno River.